Extremely effective spray conditioner, which with its concentrated, two-phase formula supports the care for hair without volume. Specially developed, rich formula, with carefully selected active ingredients in high concentrations – natural extract of linden flowers and horsetail, collagen, liquid keratin, ceramides and Inutec – clearly strengthens and nourishes the hair as well as improves its dynamics and protects against damage, providing vitality and beautiful appearance. 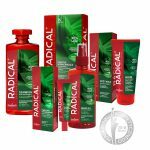 Through regular use of Radical® conditioner the hair gains greater volume, becomes light, fluffy and shiny, is easier to comb and arrange. Spray dry or damp hair from a distance of about 20 cm. Do not rinse. Linden flowers extract, horsetail extract, collagen, keratin, ceramides, Inutec. Aqua (Water), Cyclopentasiloxane, Cyclohexasiloxane, Cetrimonium Chloride, PEG-40 Hydrogenated Castor Oil, Silicone Quaternium-22, Polyglyceryl-3 Caprate, Dipropylene Glycol, Cocamidopropyl Betaine, Propylene Glycol, Equisetum Arvense (Horsetail) Herb Extract, Tilia Cordata (Linden) Flower Extract, Soluble Collagen, Hydrolyzed Keratin, Ceramide 3, Milk Lipids, Glycerin, Inulin, PPG-3 Benzyl Ether Myristate, Bis-Ethyl (Isostearylimidazoline) Isostearamide, Disodium EDTA, Citric Acid, Sodium Chloride, Parfum (Fragrance), Hexyl Cinnamal, Butylphenyl Methylpropional, Benzyl Salicylate, Limonene, Linalool, Citronellol, Alpha-Isomethyl Ionone, Diazolidinyl Urea, Iodopropynyl Butylcarbamate, CI 19140, CI 42090.